More Than Just A Dog House? By Community Chickens on March 28, 2013 Visit Community's Website. Spring is here, at least according to the calendar. 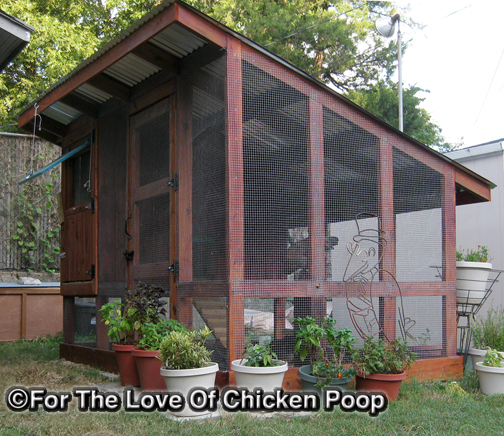 Are you planning to get chicks and also build your own backyard coop for the first time? If so then you are probably just starting to gather information or have Googled every word related to chicken coops and now want to run away! I was in your shoes this time last year and I am still far from being an expert coop builder! I am writing this post to share our experiences so far and hopefully this will help with your backyard chicken start-up adventure. 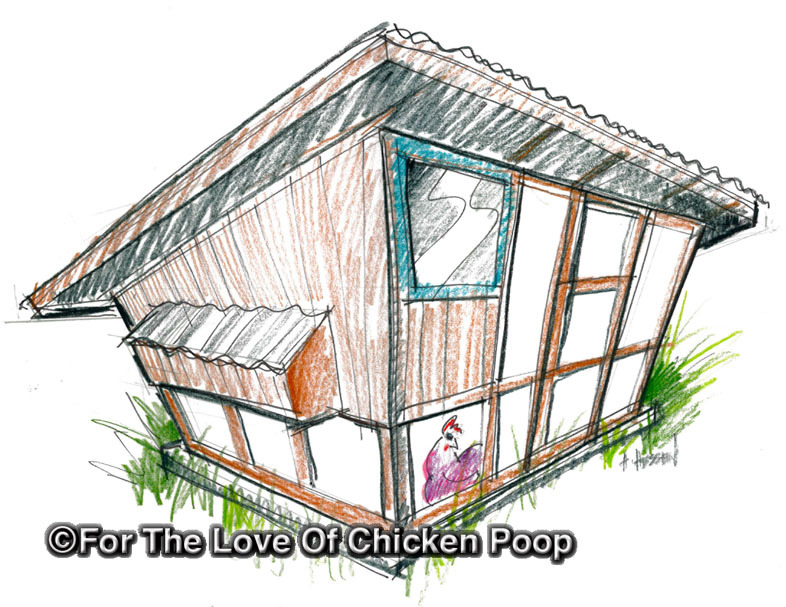 My idea of a chicken coop was a dog-house-type structure where the chickens just went in at night and slept on a pile of hay. Not quite... So the first step was research (a LOT of Google research). There is definitely no lack of information on backyard chickens and their care. You will need to weed through the piles and find the good stuff…stuff that applies to your situation. 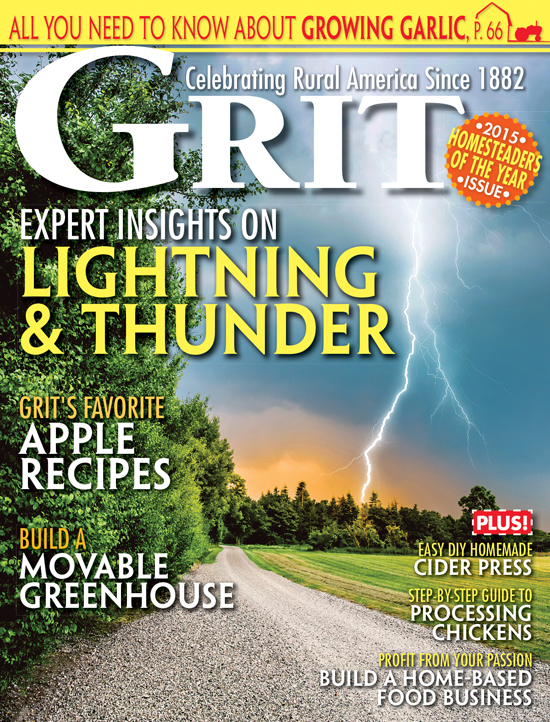 There are folks out there that have put together some great information on building coops. Find what fits your needs. Coop Size – How many chickens are you planning to have is the first question? We had ordered six chicks so we chose a medium size coop, approximately 3′ x 5′. Twelve to sixteen square feet seemed to be a typical footprint for the size of our flock. I was still in the process of building the coop when the chicks arrived. Because they were so little it was hard for me to understand the scale that was recommended . I kept on thinking that this is all too big! But after a few months, our little babies were growing like little monsters and then I worried the scale was NOT big enough. Foundation – As they always say, a good foundation is important. We used 16″ x 8″ concrete blocks for the perimeter to place the structure on. We dug down and sunk the block halfway into the ground. We used sand to help level out the blocks. It is very important that the foundation is level and square. We only used one level of blocks for the base. This has been OK so far in our case. Some people like use two levels of blocks and go deeper into the ground. The increased depth allows for more stability and also more protection from rodents tunneling under into the run. Construction – I have a wood shop and have basic skills in carpentry. I suggest you need to know the basics of wood working or have a really good friend that is familiar with the basics. And always use safety measures when using power tools. For this post, I’m not going into detail on the construction but mainly the basic points of the design. 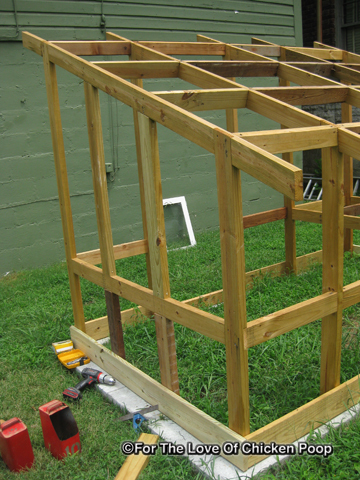 Structure – The base of the structure was a 2 x 4 framework. The roof had a 20° pitch with access on the tall side which was approximately 7′. We used a corrugated roof so the roof frame length was designed at 8′ to include over-hang on the edges. There is a fully framed door leading into the run. Although the structure should have plenty of weight to prevent the wind from blowing it over I felt the need for more insurance. On both ends I dropped 4 x 4 post in the ground about 3 ‘and set them in concrete. 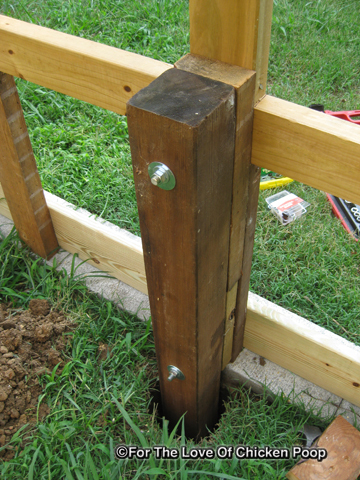 The posts were bolted to the frame. Some staining, roofing and nesting boxes. Nesting Boxes – I built 3 boxes hanging off the wall of the coop, approximately 12″ x 12″ x 12″. It also included a hinged roof for access. It was suggested one nesting box per two chickens. I went with three boxes, even though I thought I was probably limiting their options by not adding a fourth. Now, I have found that on most days our chicks lay in the same box taking turns. But they do switch boxes from time to time. Security – The walls of the coop were covered with vertical fence boards (with 1/8″ gap for expansion) making sure all areas were covered. The run framework was covered with 1/2″ hardware cloth. This will keep most small rodents out and also prevents the chickens from sticking their heads out. Again, make sure all areas are covered. 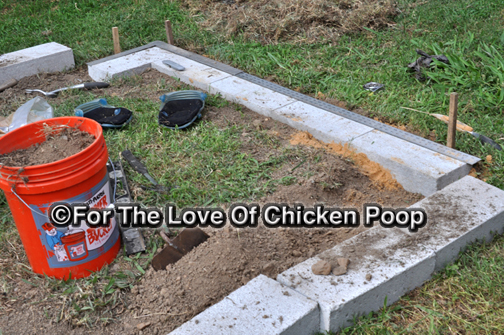 Keep in mind that besides the run area keeping the chickens in, the main purpose is to keep the predators out. The coop also has a slide down door that we close at night as extra protection. Covered nesting boxes and access-door to coop area. The Run – This was another basic requirement that I did not have a clue about. Again I thought they would just run in and out of a small fenced in area into the ‘dog-house’ I imagined. The run mainly allows a protected area for the girls to get out and run around. Guess that’s where the name came from. 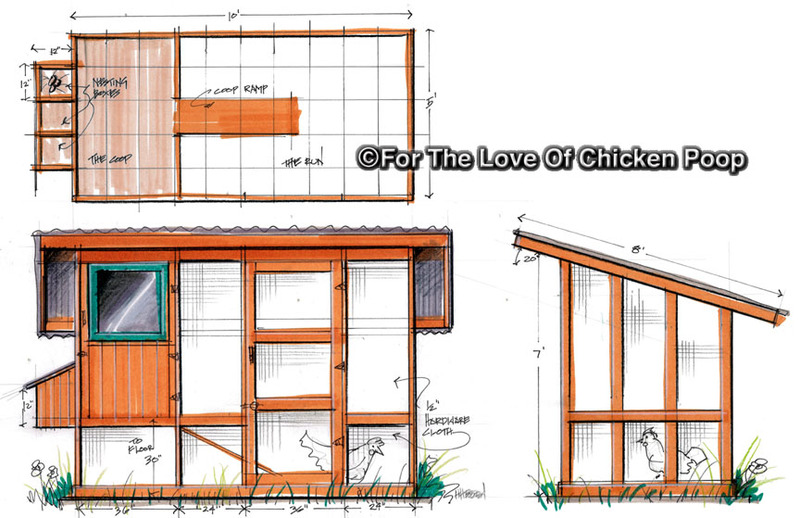 The design we chose was a basic roofed structure that incorporated the coop at one end and also the run area. This seems to be a very common design for small flocks like ours. Our structure is approximately 5′ x 10 ‘. 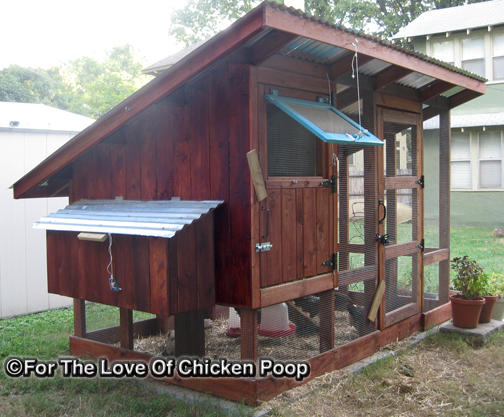 The coop is raised up 30″ off the ground which allows the full footprint to be used as the run. 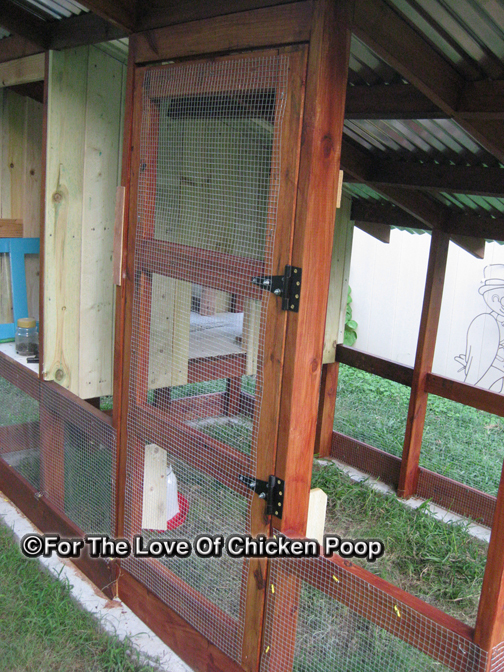 Last Details – The coop has a door at one end for easy access to cleaning. Large hinged windows are on the door and on the opposite wall of the coop. These can be opened during the warm months for flow through ventilation (note that the openings are also covered with hardware cloth). During the coldest months, when these windows are closed, I also use insulated foam board sandwiched between the hardware cloth and window. The girls also have several 1 1/2″ square perches they roost. Roosting – I had to learn about this from the ladies themselves so I’ll save it for an upcoming post. With all the guess work we did, I have to say the coop and run has worked out very well! I plan on making a few more changes this Spring and will keep you posted. This is an awesome coop- You thought through all of the challenges and it came out gorgeous…Great job! Do you have plans I could buy? PBR, a chair, coop and chickens. Good times. Nice work! 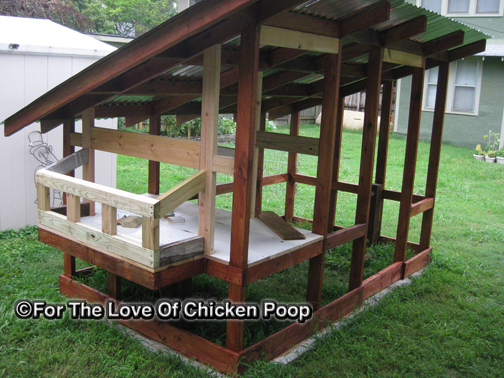 It looks very similar to a coop I built many years ago (see below if you like). One thing I added that would be nice with this too is a slide out floor for cleaning the roosting box out. It was way easier than trying to scrape out bedding and what not from the back of the roost. I also used rubber roofing (or just a large tractor innertube stapled on) as the nesting box roof. It was cheaper and very easy to do. I like this coop a lot. I think I may build one like this, but perhaps double it and raise the roost a little higher so I can hang a waterer from the bottom. Love the last photo! 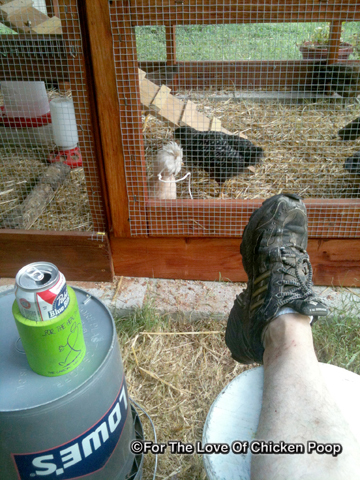 Nothing is more relaxing that sipping a beer while watching the chickens. You deserved it! Great job. can you come build one for me? I don’t have the tools, the time, or the patience.. I have 25 hens, 1 rooster, and 3 baby chicks, 8 ducks and 1 duckling. I could use 2 of them..
Those chickens live the good life. I think their coop is nicer than my apartment. Great build and what a fab coop! I could never build something like that.